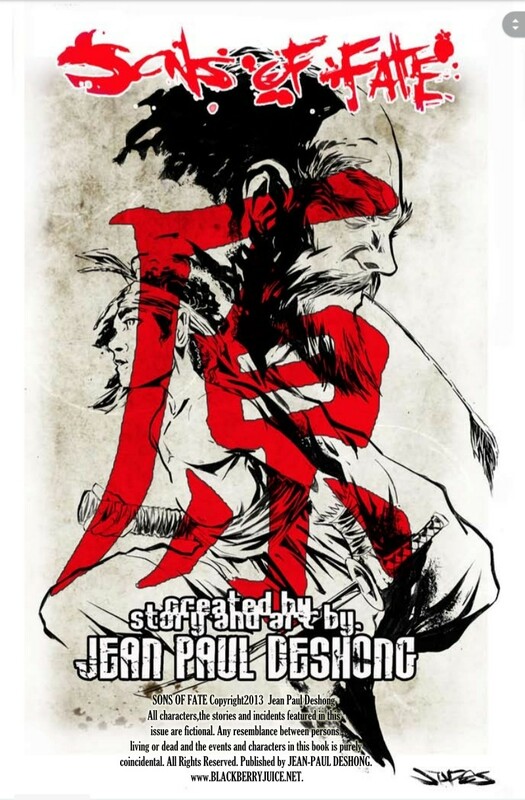 Sons of Fate: Origins by Jean Paul Deshong is an epic Samurai story that features some stunning and unique artwork and a story line that is rarely seen in today’s comic landscape. I’m going to be reviewing each installment of this series’ larger trilogy of books, each featuring several chapters to separate the main story plots and narrative. Let’s start at the beginning with Sons of Fate: Origins. The first chapter, entitled The Fateful Meeting, introduces us to Omo and his aging Samurai father as fate takes them on distinctively different life paths. Forced to grow up without his father, Omo follows the path of Bushido as he grows into a fierce warrior on his own account. 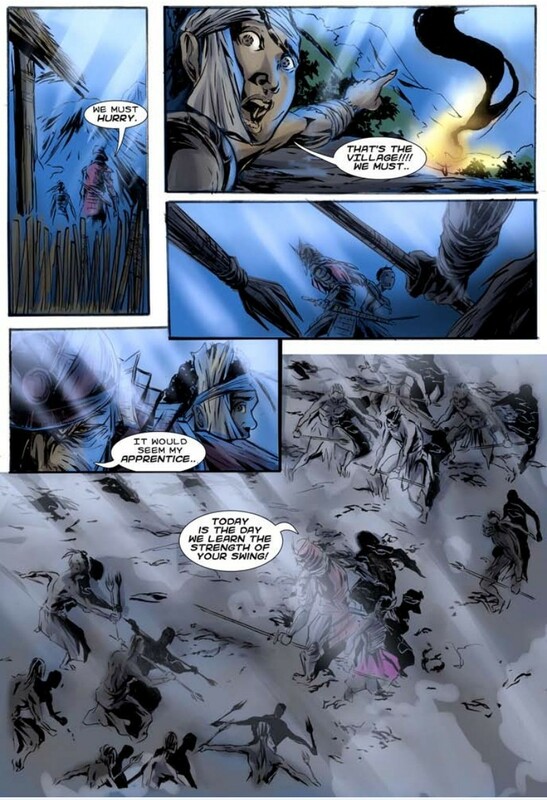 His father, meanwhile, is forced to counter pirate attacks as he leads a ship envoy across unknown seas. Eventually, those attacks overwhelm the ill-fated travelers and as the old man washes ashore in an unknown land, the narrative shifts to his son’s life. 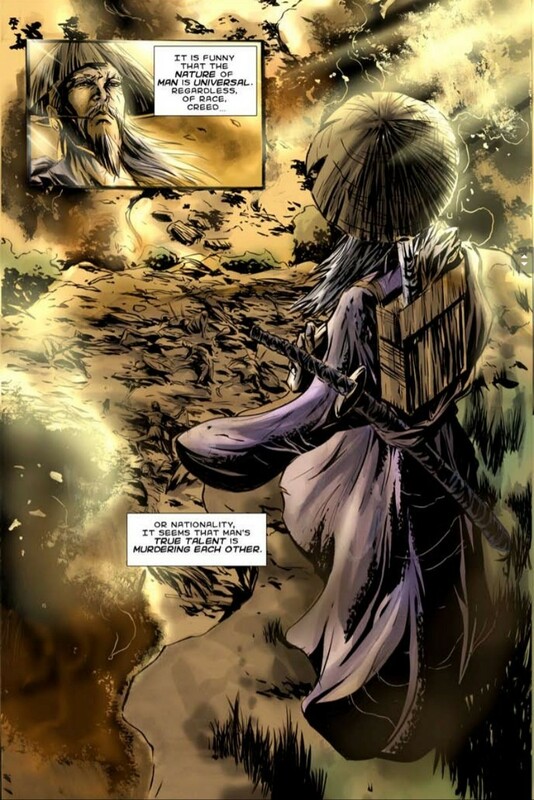 This first chapter’s artwork is different from most mainstream comic books, it retains a watercolor-like effect while effectively using a filter to further convey atmosphere. The panels gain more brilliance as the story progresses, this gives the impression that the reader is entering a more hopeful landscape. 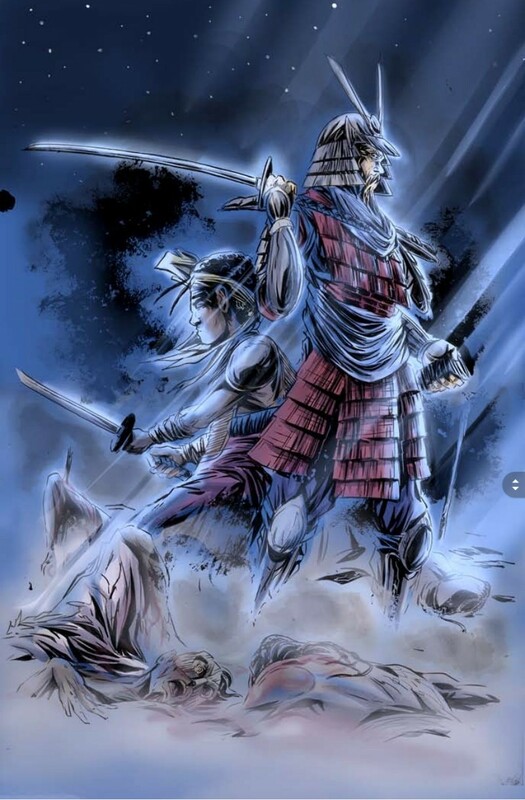 In this chapter, we see the meaning of Bushido as the old man compares his life experiences in his home country to the ones he is witnessing in this new land by highlighting the differences between the culture that he is so used to seeing versus how different this new culture is. However, the old man recognizes the similarities as the more important attributes to observe. Eventually, the old man recognizes the reason that fate has drawn him to this foreign land as he helps his young rescuer overcome his own life or death trial. As this first chapter closes, the circle of fate is made clearer as the old man recognizes that he will impart his wisdom to this young native as a tribute to his own son. 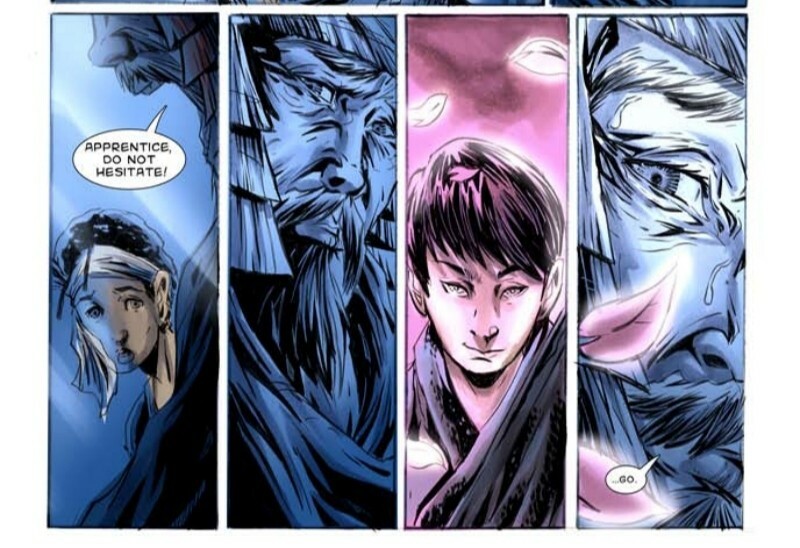 The second chapter The Little Black Samurai Boy takes a similar approach with the artwork. However, the filter in the colors takes the opposite effect as the previous chapter. Instead of the colors becoming more vibrant with each panel, this time they become noticably darker in tone. 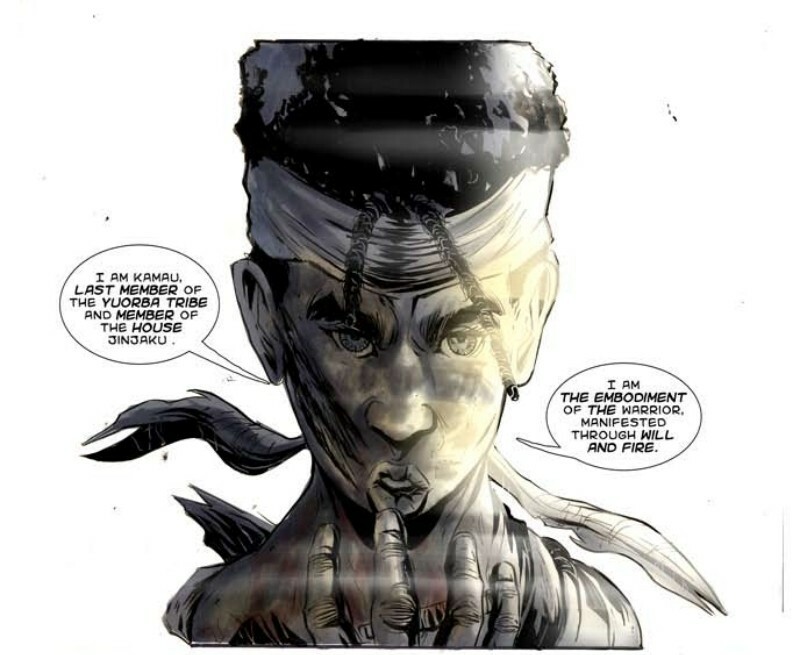 The Little Black Samurai Boy focuses entirely on the old man and his new apprentice as the true intention behind this graphic novel is finally revealed. Deshong uses this graphic novel to approach cultural clashes and historical conquests and provide social criticism on how one culture measures success by conquering other cultures. This approach, however, makes the criticism entertaining while taking itself as a serious approach to how our own history is filled with bloodshed and the murder of innocents. I commend his Deshong’s effort here. After refusing to train the village that had taken him due to his own wisdom on violence, the old man imparts a powerful lesson on his apprentice on what it means to swing your sword. To learn the the code of Bushido, and the old man comments on how the young boy has learned Japanese to the extent that he can serve as a translator between the old man and the village elders. The villagers seek his help in training their warriors so that they might attack their enemies, causing the old man to reject this request. As they complete their lesson for the day, the two are attacked by the village’s enemies, and the old man is wounded with a strange spear (it is shown to be a flint style gun). The old man recognizes that this is a foreign technology and discovers that he is not the only foreigner to visit this strange land. The final chapter Purposeful Awakenings is by far the lesser of the three entries. This chapter suffers from a few grammatical errors that should have easily been picked up by an editor. While these are minimal, they are easy to spot while reading along, but these may only be a distraction for those nitpickers (like myself). 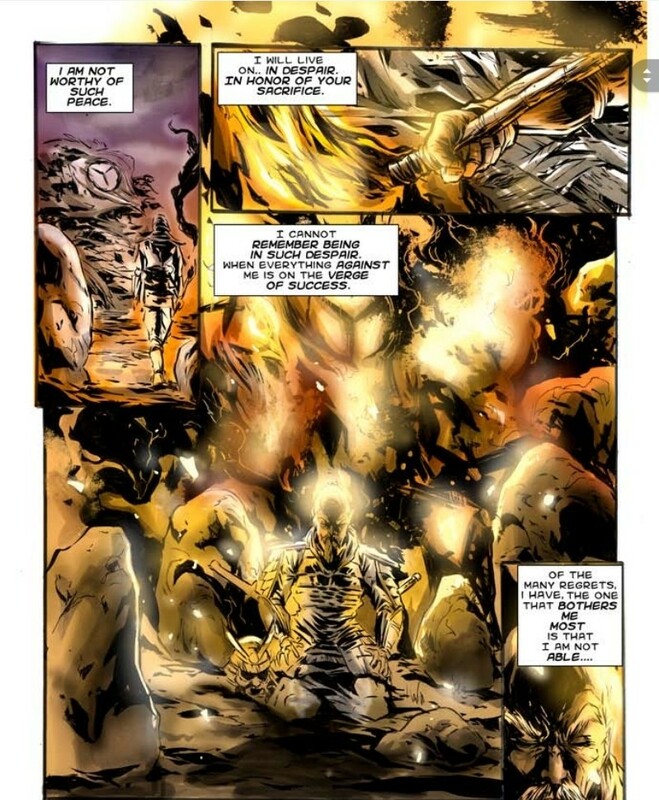 The story arrives to its clear conclusion; the old man, having imparted his teachings on a new warrior, begins to make peace with the final moments of his life. Together, they face the new enemy as the old man reminisces on his previous life and how this young apprentice has taken the role of his son in his new life. There are a lot of emotions in this chapter, and while the pacing and art contribute greatly to the overall context, it’s the writing that drives that final dagger into the heart so beautifully. The final panels close this story in a way that while satisfactory, certainly leaves the reader wanting more. I know I’ve been slowly developing a reputation of reviewing comics very harshly. Some creators may feel that I’m belittling their work. That isn’t my intent. So as I was reviewing Sons of Fate, this story had all the makings of what might be called a “white guilt” story. However, it takes the higher road and instead gives us a classic story of family and honor. Every single time that I thought I could see the toxic mainstream identity politics about to peer its ugly purple-haired face on a panel, I was consistently surprised by the professionalism and flow that the story maintained. While deftly raising some criticisms on how we view our history as a people while we see hints of slavery taking place. I give this book a 4 out of 5. While it has a fantastic story, there are very little deviations from the story arc that were outside expectations. And while you can’t go wrong by sticking to basics, Origins had the opportunity to expand more on the main characters early on to give readers even bigger reasons to emotionally invest in their lives. The way the art is handled also greatly adds to the experience, but the rushed feeling and a few unfortunate grammatical errors in the third act unfortunately took me out of the story. This is the first part of the Sons of Fate trilogy that I have been given the opportunity to review. I plan to post the second part of my review of the trilogy this Friday, December 14, with the final installment to be posted on Monday, December 17. 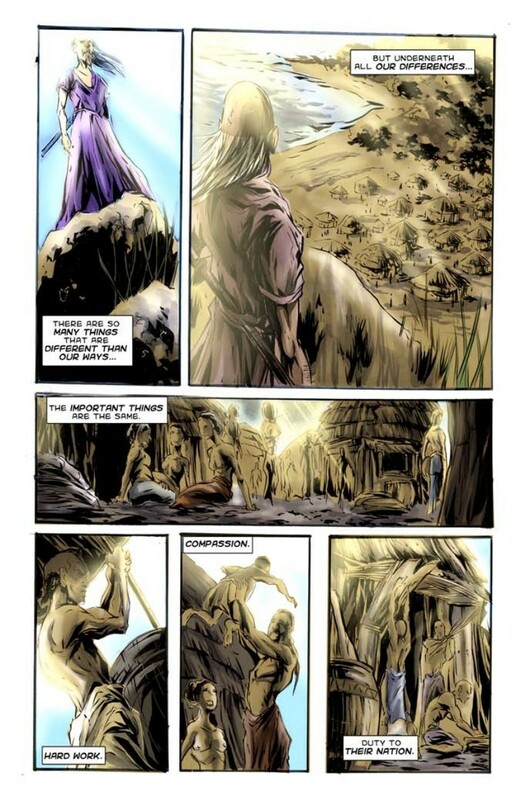 In the meantime, I recommend that you can pick up your own copy of this graphic novel and check it out for yourself at https://www.comixology.com/Sons-of-Fate-Origins/comics-series/34091. PREVIOUS POST Previous post: Theories from the Multiverse – Flashpoint Batman is Back?! ?